When Sasuke was young, his clan was murdered by his older brother, Itachi. With his parents and family now gone, his brother spared him and left him to survive by himself. He told Sasuke to hate him. Sasuke tried to forget about the past by applying himself in the ninja academy and fitting in with the rest of the leaf village. After his fight with Naruto, he believes he's been wasting his time "playing ninja" with the people of the leaf village. His new goal is to get stronger so he can avenge his clan by killing Itachi and then restore the Uchiha clan. As a wielder of the Sharingan (the kekkei genkai of the Uchiha clan), he learns to use Chidori and has a vast knowledge of the various Fire Jutsus. The curse seal which Orichimaru gives him during the Chuunin exam, at first, enhanced his power but at the risk of killing him. Now he can use it of his own free will. Claiming at first that he doesn't need any friends, he is forced to contradict himself when he sees that either Naruto or Sakura are in danger. 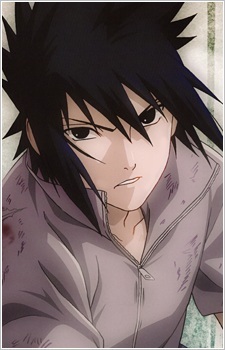 Remembering this type of Sasuke is what brings motivation to Naruto. Sasuke openly admitted to Naruto that he was his closest friend. Sasuke has black hair with a blue tint that lengthens as the story goes with onyx eyes and has lighter skin than his brother Itachi. Like many other members of his clan, his hair hangs over both sides of his face to roughly his cheeks. In his curse seal form, he has grey skin with wings on his back that resemble giant webbed hands. He also has hair similar to Madara Uchiha except in a greyish-blue color. In Part II, Sasuke has grown noticeably taller (almost eye height with Itachi) and slightly more muscular. wears a white long sleeved shirt that's open at the torso with a smaller version of the Uchiha crest on his collar. He wears black pants with a blue cloth hanging from his half way up his stomach to his knees. He also wears a purple rope belt (Japanese name: Shimenawa) tied in a bow fashion found on many Sound ninja, only the bow is in a different style and is tied in the front instead of the back. He also will at points remove his shirt and hang it from his belt around his waist to give his wings in Curse Seal Level 2 room to move (also without transforming). Sasuke, even though claiming to be emotionless, wouldn't kill unless it was necessary until Madara Uchiha twisted his personality even further by telling him that his brother, Itachi, after he had killed him, was ordered to kill their clan and suffer for the sake of the village. After knowing this, he suddenly turns far colder and seeks for revenge on Konoha. However, after he had calmed down, he noticed how confused he really was and revived Orochimaru to request answers to his questions about his clan, Konoha, and what shinobi and the Hokage really are. He's currently helping Naruto and the others put an end to the war and announced that he plans to become the next Hokage. But when the the war concluded, Sasuke made it clear that his goal was to become a new kind of Hokage, a kind of Hokage that wants to banish darkness from the Ninja World and to do so he believes all the old Kages should be killed. He also wants to conclude things with Naruto and so he invites him to one final concluding battle. The battle ends with both Naruto and Sasuke losing one of their hands. While both lie on the ground he finally accepts Naruto's feelings and stops his path of revenge to return to the village. In chapter 700, it is shown that he has a daughter with Sakura.